The 20th ONroute service centre opened near Innisfil on Monday, capping off a six-year, public-private partnership project catering to drivers on Ontario highways 401 and 400. “We competed to win that opportunity and put forward a team who we thought could achieve outstanding design, flawless execution and a great brand offering for the travelling public with a very high level of service,” Host Kilmer Service Centres chairman Ken Tanenbaum said of being chosen by Infrastructure Ontario to design, build, finance and operate the sites under the jurisdiction of the Ministry of Transportation. “Host Kilmer leases the land from the province and the province sets very rigid performance specifications and determines all of the minimum service levels that are required on a site,” Tanenbaum said of the facilities that never close. Host Kilmer is an alliance between: HMSHost, the world leader in travel dining and shopping; and Kilmer Van Nostrand, a Canadian company with extensive experience in building public infrastructure. Tanenbaum, who’s also vice-chairman of Kilmer Van Nostrand, said the service centres were Infrastructure Ontario’s first revenue-based deal and “we were also fortunate enough to be involved with the second one, which was the development of the Pan Am Games Athletes’ Village. Quadrangle Architects Limited and Bruce Mau Design were retained to design the ONroute centres, which share a basic design but are of different sizes based on nearby traffic densities. They incorporate indigenous stone walls, wood trellises and canopies, and sloped metal roofs and glass walls that allow in plenty of natural light. EllisDon Construction built each of the 20 properties, which can be found stretched across almost 1,000 kilometres of highway that accommodates more than 500,000 people daily. 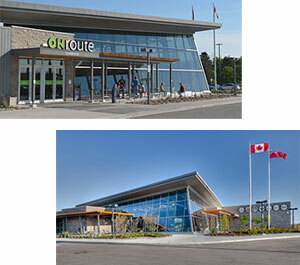 The average cost of an ONroute centre, each built to LEED Silver standards and participating in the BOMA BESt environmental performance program, is about $20 million. Each location features a Canadian Tire full service gas bar and The Market convenience store. A mix of other brands — A&W, Big Smoke Burger, Brioche Dorée, Burger King, East Side Mario’s Pronto, Extreme Pita, KFC/Taco Bell, New York Fries, Pizza Pizza, PurBlendz, Starbucks Coffee, Swiss Chalet Express and Tim Hortons — provide nourishment among the various sites. “It’s about diversity, choice and selection,” said Tanenbaum. There are three other service centres in the Ministry of Transportation network that were built in the 1990s and which are located near Maple, Newcastle and Ingersoll that are under an Esso head lease. They’ll come under the ONroute umbrella when those deals expire in 2023, 2024 and 2025. There are currently no plans to build more service centres on other highways, but Tanenbaum said there’s always potential for that in the future.